We’ve recently marked Valentine’s Day, which isn’t a Spring festival per se, but, like Carnival, is viewed as being something of a harbinger of Spring. There have been some warm days in February, so our robins have been tricked into thinking that Spring is already here. The Vernal Equinox takes place in March. By definition (as “vernal” means “of the Spring”), this is when Spring begins. This year we have to wait till late April for Easter. To many, that is the unofficial start of Spring. Then at the end of the month, Beltane (a Celtic Spring festival) will still be marked by some. So take your pick! Spring can start any time between January and May, although March and April are the most popular choices. This can be a wonderful season for a ceremony. Obviously, in this country, you face the probability of a bad weather day – snow and ice are quite likely at this time – and I’ve conducted a few ceremonies in such conditions. In contrast, you may chance upon some glorious sunny days with a bit of warmth in them. The sun and blue skies can be so uplifting (and, of course, snow creates a fantastic atmosphere of its own). So, as long as you prepare for all eventualities, even an outdoor ceremony can be recommended. So it may well be worth having a gamble on the elements and going for a Spring ceremony. Remember, in winter, the odds are high that the day will be cold and also wet. A Summer ceremony runs the risk of sunburn/sunstroke and even thunderstorms – not to mention, gnats. 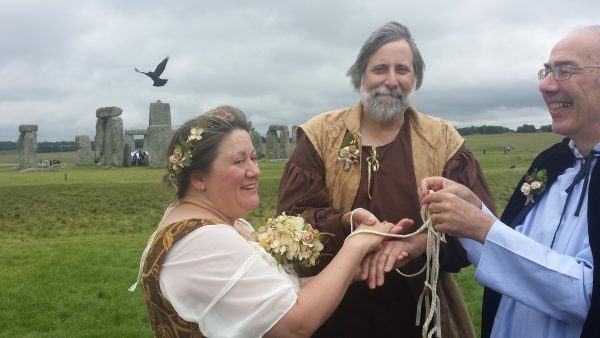 If you decide on, and I recommend it, an outdoor ceremony, feel free to speak to me and I shall be glad to help.